The anticipated rain made its appearance at the US Open Thursday, but a dry stretch of four hours in the afternoon allowed the junior doubles quarterfinals to be completed, as well as six of the eight matches scheduled in the opening round of the American Collegiate Invitational. Three Americans reached Friday's doubles semifinals, with the wild card team of Brandon Holt and Riley Smith continuing their impressive run in the boys draw, and Francesca Di Lorenzo advancing with her Brazilian partner Luisa Stefani. Holt and Smith, who finished third in Kalamazoo this year, got off to a slow start against unseeded Lukas Klein of Slovakia and Patrik Rikl of the Czech Republic, but finished strong in a 2-6, 6-3, 10-4 win. They will play unseeded Lloyd George Harris of South Africa and Yosuke Watanuki of Japan for a place in the final. For more on Holt and Smith and their famous parents, see this article at usopen.org. Di Lorenzo, the only player still left in both singles and doubles, and Stefani needed nearly two hours to get past No. 4 seeds Anna Blinkova and Olesya Pervushina of Russia 7-6(6), 6-7(5), 10-7. The No. 5 seeds had their chances to avoid the match tiebreaker, going up 5-1 in the second set and holding a match point at 5-3 on a deciding point. 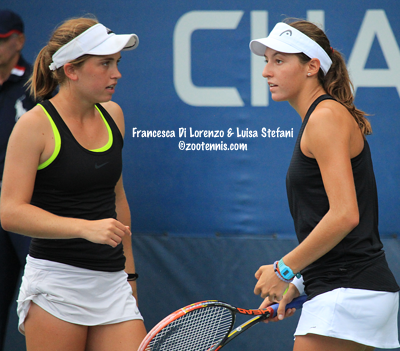 Up 6-5 in the second, Di Lorenzo and Stefani had three more match points, but couldn't convert them. After the Russian team won the second set tiebreaker, Di Lorenzo and Stefani took a 7-2 lead in the match tiebreaker only to have Blinkova and Pervushina win five straight points. Di Lorenzo finally held her serve to end that streak and move ahead. 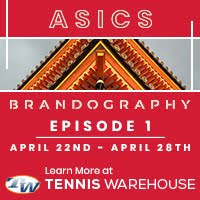 An assertive poach and forehand volley winner by Stefani gave them two match points and they were able to convert on their fifth opportunity. "She stepped up real big," said Di Lorenzo, who has won two Grade 1s and a Grade A with the Pepperdine freshman. "She moves a lot at the net and she had a really good cross." Di Lorenzo will play Iryna Shymanovich of Belarus in Friday's quarterfinal, with Shymanovich the player who beat Di Lorenzo 4-6, 6-1, 6-2 in the second round of the US Open junior championships last year. "I need to stay with it the whole match," Di Lorenzo said of the rematch. "Last year I won the first set and I was kind of shocked, so I need to believe that I can win. And I know I can, because I was close to her last year. I went out being aggressive and then I lowered my game and the momentum switched and she took hold of it. I know she's a big ball striker and likes to hit those lines, so I've just got to keep it deep and use my serve well." Di Lorenzo and Stefani, the only seeded team remaining in the girls draw, will play Viktoria Kuzmova of Slovakia and Aleksandra Pospelova of Russia in Friday's semifinals. The men's American Collegiate Invitational quarterfinals went to form, with the four seeds advancing. NCAA champion Ryan Shane, who will be returning to Virginia for his senior year, defeated UCLA graduate Dennis Mkrtchian 6-2, 6-1, despite getting only 43 percent of his first serves in and double faulting seven times. He will play No. 4 seed Gonzales Austin, the Vanderbilt graduate, who got by Columbia graduate Winston Lin 6-4, 6-3. UCLA junior Mackenzie McDonald, the only 2015 participant who also competed in the inaugural ACI last year, downed Notre Dame senior Quentin Monaghan 6-1, 6-4. He will play Virginia junior Thai Kwiatkowski, who defeated Illinois senior Jared Hiltzik 6-2, 3-6, 7-5, coming from a break down in the third set. "I felt like the match was definitely in his control," Kwiatkowski said, with Hiltzik serving at 4-3 in the third. "And I just told myself to try and enjoy the moment and put as many returns as possible in the court, give myself at least a chance to come back late in the third set. A few points here and there, a few balls, and the set could go either way and I was lucky to get a few points there at the end." Kwiatkowski had six aces in the final set, but said he relied on his forehand throughout the match. "I just tried to play my game, which is to hit a lot of forehands," Kwiatkowski said. "Late in the match everyone is very nervous, so to just relax and try to use your weapons as much as possible, was what I was trying to do. But like I said, it could have gone either way, just a few points here and there." Two of the women's matches were completed, with alternate Chanelle Van Nguyen, the UCLA graduate, beating top seed Brooke Austin, the Florida sophomore, 7-5, 6-3. 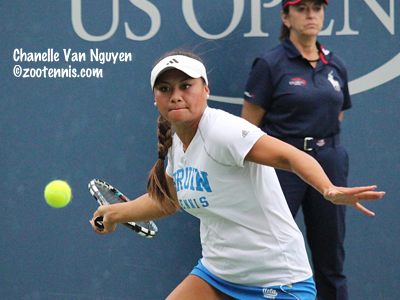 Van Nguyen participated in the World University Games this summer, but that was virtually the only tennis she played, and it was only late last week that she learned she would be participating in the ACI. "I just got out of the dentist and someone called me and said, like, you're in now," said Van Nguyen. "My dad did come up to LA to help me, he fed me balls, and I started to set up hits three times a day. But I really surprised myself." Austin had reached the final of a $25,000 event and the semifinals of a $50,000 event this summer, so her performance today was disappointing based on those expectations. "This summer I gained a ton of confidence because I did so well," Austin said. "So I feel like even though I didn't play my best today, my level's higher than it was last year. She played well and I definitely put too much pressure on myself, which I somehow always do at the Open." Van Nguyen will play No. 3 seed Lauren Herring, the Georgia graduate, who beat Cal junior Maegan Manasse 7-6(6), 6-1. Down 3-1 in the first set, Herring worked out her nerves, and raised her level as the match progressed. Down 3-0 in the tiebreaker, Herring won six straight points, but Manasse saved those three sets points. Herring earned another set point and Manasse netted a volley, and took a 4-0 lead in the second set before got on the board. "I got down a break pretty early, but I knew if I could dig out one of her service games, anything could happen," said Herring. "I didn't get off to the start I wanted to, but I kind of had the same mindset, that I didn't come back to lose a breaker, so I hung tough and managed to edge her out there in the second set." 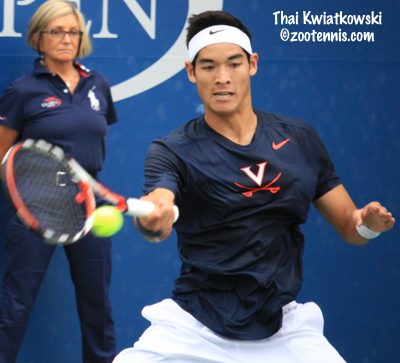 Although Herring and Van Nguyen have know each other from back when they trained at the USTA in their teen years, they never met in college. "I honestly can't even remember the last time I played her," said Herring, who is working with Brian de Villiers in Atlanta now. "I didn't even know I was playing Chanelle, I only look at my first round. We warmed up this morning. Chanelle plays a lot different from Brooke, so it could turn out to be a long and tough match." The other two women's matches were still in progress when the late afternoon storm arrived, ending play for the day. No. 2 seed Robin Anderson, the UCLA graduate, lead Florida sophomore Josie Kuhlman 6-0 and Julia Jones, the Ole Miss graduate, led No. 4 seed Julia Elbaba, the Virginia senior 7-5, 3-2. Those matches will be completed Friday morning, with the women's semifinals following the men's semifinals. In addition to Di Lorenzo, American juniors Taylor Fritz, Alex Rybakov, Tommy Paul, Michael Mmoh, Sonya Kenin and Kylie McKenzie will play quarterfinal matches on Friday. The schedule for Friday is here. 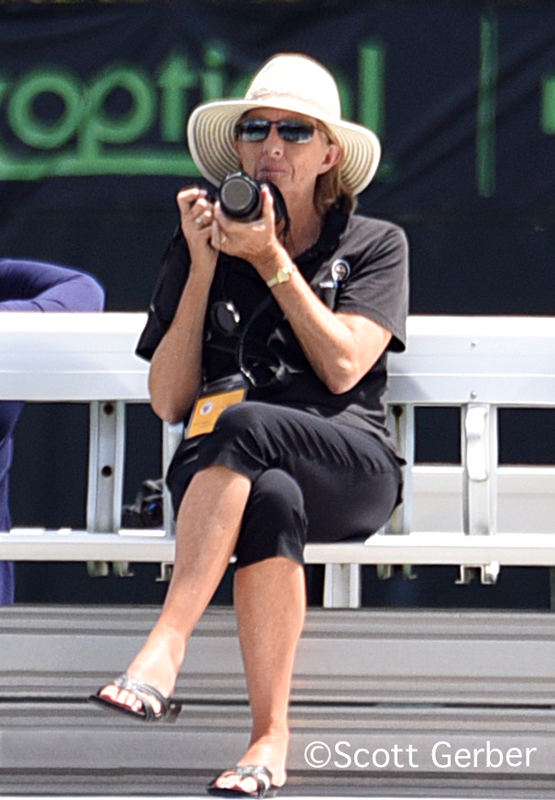 Colette, thanks for covering the Juniors/College events, since the USTA/ESPN have turned off the Streams for the the courts the Juniors/Collegians are playing on. It would be interesting to hear the rationale for turning off the streams. It's not as if the USTA even needs commentators. Just a live feed would be great for those of us who can't attend the event. Then again, there may be only a handful of us family and friends that would be watching anyway. I'm sure that they have no rationale as usual. They were obviously too lazy, incompetent and inconsiderate to simply flick the switch on to make the matches accessible by streaming. They couldn't get it together to do such a simple thing. Thousands of fans around the world would have watched those live streams, but instead we got another lost opportunity and disappointment number 356,781. I've counted all of them. If the past is any example, they will keep coming. Colette, I am baffled as to why the USTA does not run live streaming of the US Jr. Open. And what are you thoughts on why ESPN or the Tennis Channel doesn't show the NCAA championships? Is their really no interest from fans so no money for the channels? I too am baffled by the lack of streaming for junior and collegiate matches at the US Open. The Tennis Channel did cover the NCAAs up until 2008. And I believe ESPNU did the 2010 team finals. I'm not sure what led them to discontinue that. I do know that the production teams necessary to cover a college match are large with six matches at once, but it doesn't explain why they don't cover the NCAA singles finals.